The four farmers who make up Eugene’s Ant Farm Collective grow staple crops and produce, selling them to local markets and restaurants as part of a burgeoning “new farmers movement” that is using small-scale, sustainable farming to revitalize local food systems. But unlike other beginning farmers who rent or borrow money to buy land, Shelley Bowerman, BA ’09, and her partners rely on shares or work exchanges arranged with landholders. The “Collective” part of the Ant Farm, in other words, refers to the seven different sites on which the group of farmers grows food. The ant farmers—Bowerman and partners Lauren Bilbao, Claire Schechtman, BA ’13, and Dan Schuler—each live on different sites and have their own kitchen gardens, but share the work in the common plots that produce the market goods: many hundreds of pounds of tomatoes, potatoes, onions, winter squash, and other hearty, nutrient-dense food. 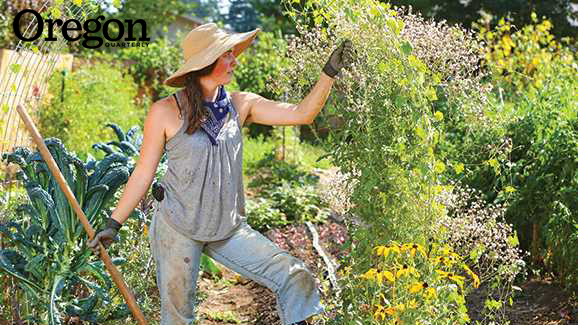 Bowerman’s motivation to farm stems from a family interest in horticulture and her experience with several programs at the University of Oregon, where she earned a bachelor’s degree in international studies. Her heart set on a career employing grassroots activism, she started growing food on the lot of her quarter-acre rental house. Soon the grassroots grew into advocacy projects closer to home, including the Ant Farm, which started in 2008 when Bowerman and partners expanded into her neighbor’s backyard. And localizing change meant working on the southern Willamette Valley food shed, close to home. Instead of taking the path of most resistance to protest inequities in the industrial food system, Bowerman began working with fellow students to invent alternatives. She was transformed by the thought of creating new possibilities. One idea, borne from a desire to bring more local food to the UO dorms, led to Project Tomato. Now in its seventh year, Project Tomato builds networks among new freshmen, who bicycle to local farms and pick and process tomatoes that become pizza sauce in the Carson dining hall. After she graduated, Bowerman was hired by the UO’s Office of Sustainability to help administer Project Tomato, working there until farming success enabled her to move on last year. Jennifer Burns Bright teaches English and comparative literature at the UO and is a freelance food journalist.